A large part of obtaining Eagle scout status is to do a project that benefits the community. Often these are things like park benches, drinking fountains, etc. Jacob Bruner had different ideas though. He wanted to bring 3D printing to his community. I especially loved the fact that this project doesn’t just provide something to the community, but also encourages other people to make things! Jacob, can you tell me a little bit about what you’ve put together? For my Project I created a 3D printing Lab in my Local Public Library. It took me about 9 months from start to finish. 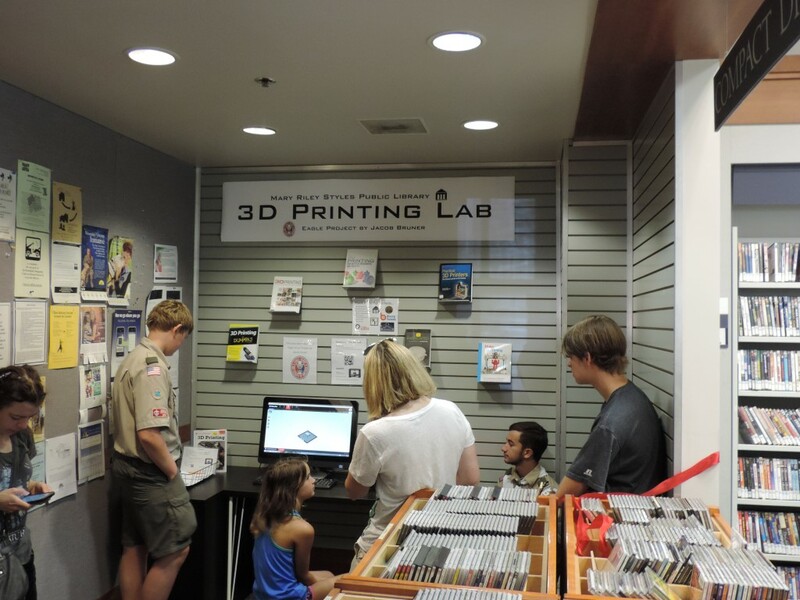 In that time I attendend board meetings, raised awareness, taught the public about 3D printing, fund raised almost $3,500 and built the lab and put it into the library. I also am in charge of finding volunteers to run the area because the library cant quite yet devote a staff member full time. How did you end up deciding to do a 3D printing space in your library? Originally for my project I was just going to put in park benches, but one day over dinner I had this idea, and I just HAD to do it. I am really passionate about 3D printing. It’s been a huge hobby of mine for about 3 years now. It started when i saved up my money to buy and build a Thing-o-matic, and since then its sort of taken over. Ive built two 3D printers, and I also got one in our school. Ive done presentations in the library and local clubs that im involved in, and I think its something that everyone should have access to. It’s just so cool, and I really think its the future, and I want to bring people into the future. What kinds of things are people printing there? Well right now we have a whole range of things. Mostly toys printer buy younger visitors, but as word spread that the printer is available we have been getting requests by artists for pieces they’re working on, another person needed a new hinge for a boat window that can no longer be bought, and i spoke to a person who is interested in printer parts for his custom guitars he makes. I can foresee a greater variety in prints as time goes on, after all its just coming up on it 1 month birthday. Where is this located, just in case a Make reader happens to be local and would like to visit? Its in my local town library, Mary Riley Styles Public Library in Falls Church City, VA. Here’s the libraries webpage, but we have also made a page just for the printer.